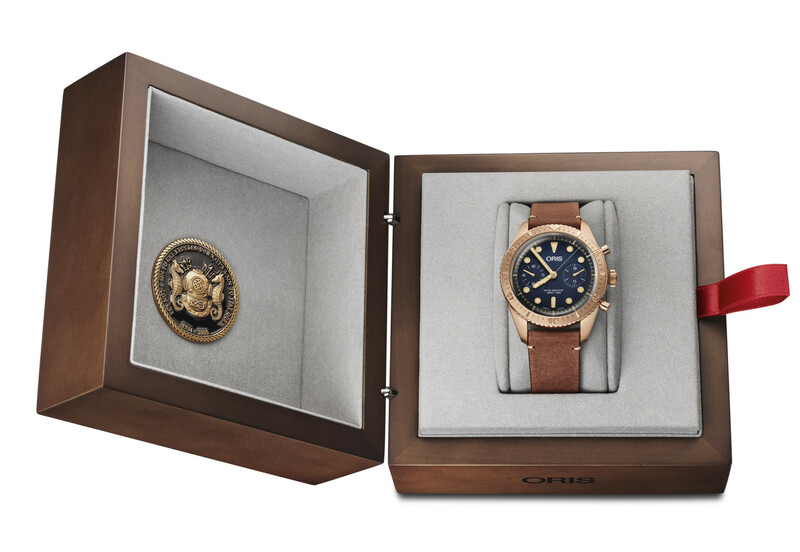 Swiss watch brand Oris has teamed up with the Carl Brashear Foundation once more to launch a bronze chronograph in honour of the deep sea diver of the same name. This limited edition chronograph, similar to the previous bronze piece from Oris, will be restricted in production to just 2,000 pieces. Inside the watch is a Calibre 771, a movement with a two-counter chronograph and a 48-hour power reserve. It’s based on Sellita’s SW 510 and appears in the Oris collection for the first time. The 43mm piece sports a bronze uni-directional diver’s bezel, while the dark blue dial, which is domed much like the sapphire glass with it, features rose gold indicators for the hours, minutes and seconds, as well as rose gold for the chronograph hands. The watch has a stainless steel case back embossed with a diver’s helmet and Carl Brashear’s famous quote: “It’s not a sin to get knocked down, it’s a sin to stay down.” It comes with a vintage brown leather strap and is presented in a wooden box which comes with a Carl Brashear Foundation coin also. The watch is set to retail for around £3,540.